2)The Walk-in-interview will be held as per detailed above at this station. 3) These temporary engagements are for a specific period mentioned above and co- terminus with the project or even before on the discretion of the Competent Authority. The Senior Research Fellow and young Professionals (Y.P.- 1) will have no right to claim any employment or engagement in the ICAR - CICR. one hour written Test on the date of Walk- in-interview. 6) The candidates may bring with them original certificates for verification and one set of their photocopies in support of Age, Qualification, Experience, Caste, Employment Exchange Registration card and one passport size photograph to be enclosed with application. 7) Since all the above positions do not have status of regular employees they are not entitled for any regular leave except 8 days CL e,2 RH. Maternity/paternity leaves as applicable. 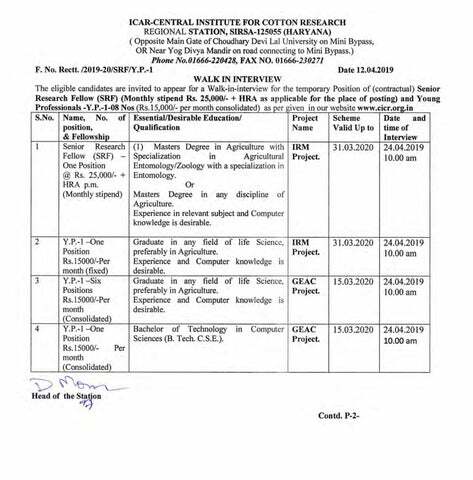 8) Candidate without provisional Master D.:q*: inAgriculture and B.Sc.(Agricuttorg!"AJgr.. the concerned university will not be eligible for walk-in-Interview. fill up or not to fill any vacancy notified in the advertisement. Upper Age Limit: 2l-45 years for Y.P. as on the date interview (Relaxable in the case of SC/ST/OBC & other exempted categories of Candidates as per Govt. Of India rules).